1. The bold message, “YOU,” immediately creates a bond between me, the customer, and what could easily be perceived as a giant, faceless corporation. 2. It has some very specific information for me: that Starbucks bought 228 million pounds of responsible grown, ethically traded coffee last year. That sounds like a LOT of coffee, doesn’t it? 3. They didn’t stop with the big, impressive number. 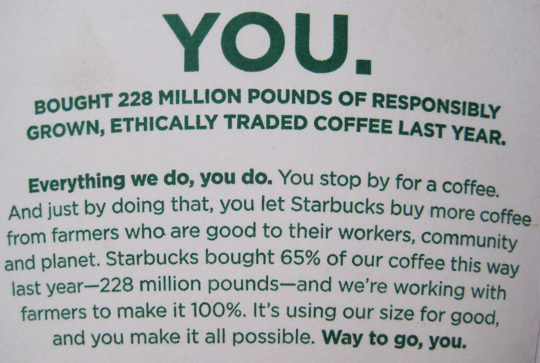 They put it in context: that’s 65% of all the coffee they bought. Measuring like this probably means they have a real handle on their other environmental impacts as well. 4. And, they tell me they are working with farmers to make it 100%. NOW, I’m really impressed. Both with their audacious goal and with the fact that they see it as a cooperative venture. Without the farmers they’d have a hard time making coffee. 5. They also say they are “using our size for good.” Feel the power in that statement? Business as a tool for positive change – has a wonderful ring to it, doesn’t it? Before you start thinking, “Yes, but it’s Starbucks, for goodness sakes!” remember that ANY business – yours included – is potentially a powerful transformational tool. 6. The message, “you make it all possible,” reinforces what must be an authentic core value of their business. Without the customer, it’s all pretty irrelevant, isn’t it? Take a moment and think of all the clients and customers you’ve interacted with over the past five years. Didn’t they literally make it possible for you to live your purpose through your business? 8. The idea of using a utilitarian part of one’s business – the humble coffee cup – to convey such important information is also brilliant and not to be overlooked. What are you overlooking in your business that could instead be bringing an inspiring core message to your customers? 9. They close with a way to go even deeper. “Find out what else you can do at starbucks.com/sharedplanet,” which allows the curious customer to learn more about their environmental initiatives. On that site (yes, I went there! ), you can download their “Global Responsibility Report,” see their 2015 goals and learn about everything from store designs to community involvement. 10. Does Starbucks know their market? They seem to be doing an admirable job keeping up with their customers’ values, and reminding us of it whenever we buy from them. Truth be told, as much as I love this cup, I’m still far more likely to go to my locally-owned coffee shop (that also serves fair-trade coffee). For those times when I fall off the wagon and succumb to Starbucks, at least I know I’m “making it all possible” for them to use their business as a tool for good in the world. That’s very interesting. I’m glad to hear that big companies are actually paying attention and doing their share in helping the environment.